This is the Version History page. Go back to the CHARTS page to download the latest version. An updated plot for Lake Baikal record from Prokopenko et al. (2010) for the period 1.2 to 2.7 Ma was added. Marine Isotope Stratigraphy curve replaced with the Lisiecki & Raymo (2005) LR04 Stack [was a curve of Crowhurst (2002), modified Tzedakis et al. (2006)]. Magnetostratigraphic events within Brunhes replaced by Lourens (2004). Base Quaternary and Pleistocene cf. IUGS-ratified definitions. 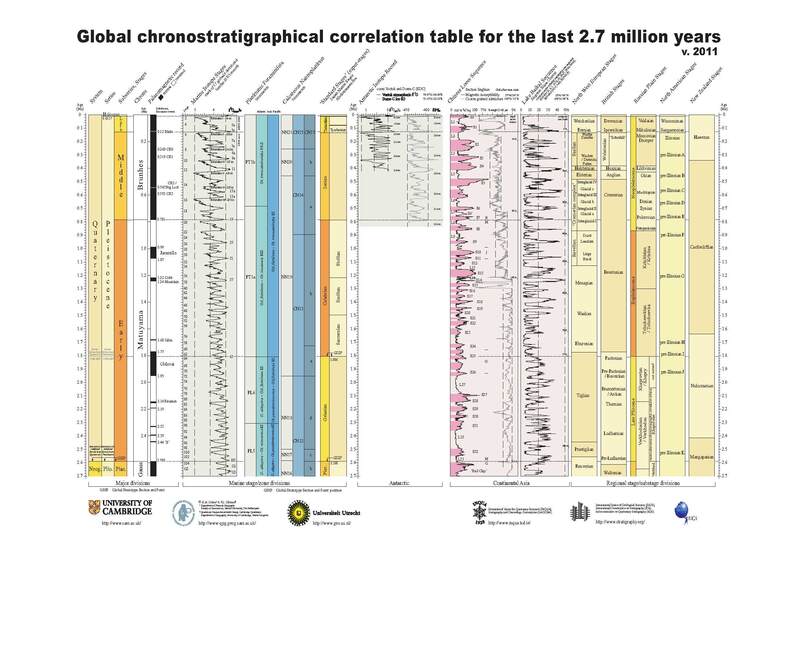 Chinese Loess sequence updated: grain size record added, mag. susc. record replaced, section location and sequence thickness updated. Lake Baikal biosilica record added. In the NW Europe column, Tiglian substages were removed. Systems/Series columns show the nomenclature following the ICS formal voting (14.4.07). Marine oxygen-isostope curves updated to a new standard composite curve. Position of the Italian / Mediterranean ‘Standard Stages’ column moved. Displayed below is v.2007b in low resolution. For download are: a bigger jpg version (2.4 Mb) | a printable version (PDF). 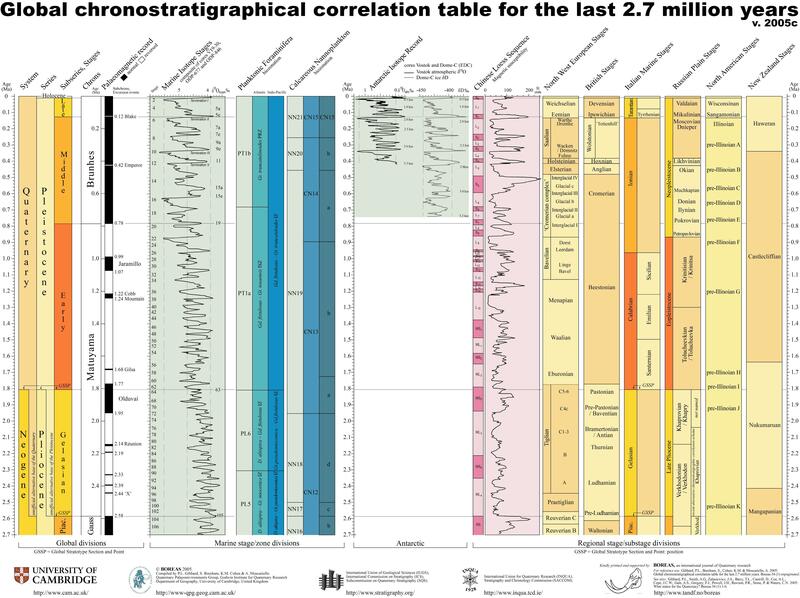 The 2005 version of the chart was published as an unpaginated inclusion with Boreas volume 34 (1) and web-published on this site. In this version some minor errors were fixed (misspelling, numbering of soil-loess complexes skipped a beat). Depth down core in the Antarctic ice core records added. 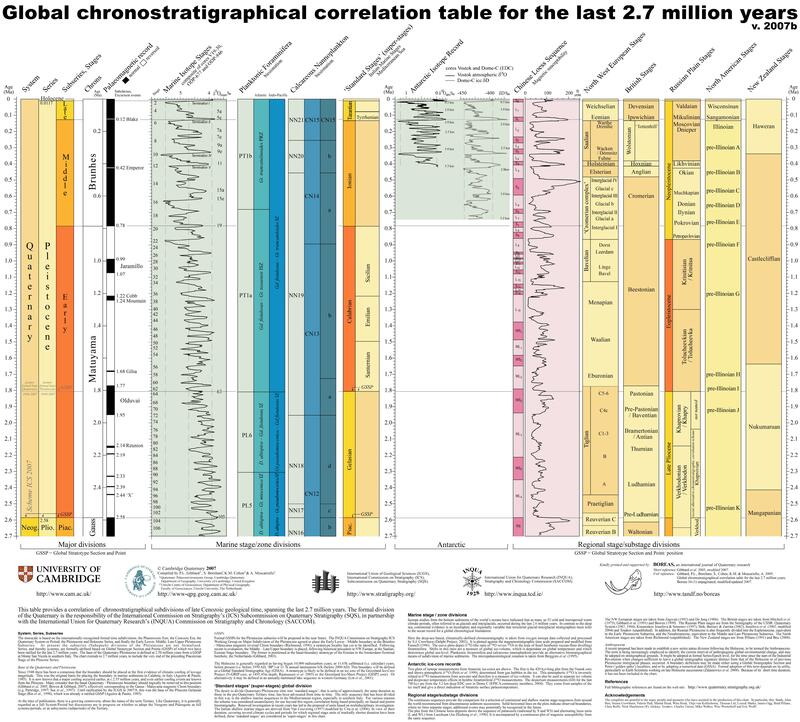 Displayed below is v. 2005c in low resolution. Also available are: bigger JPG version (896 Kb) | a PDF version | Documentation PDF. 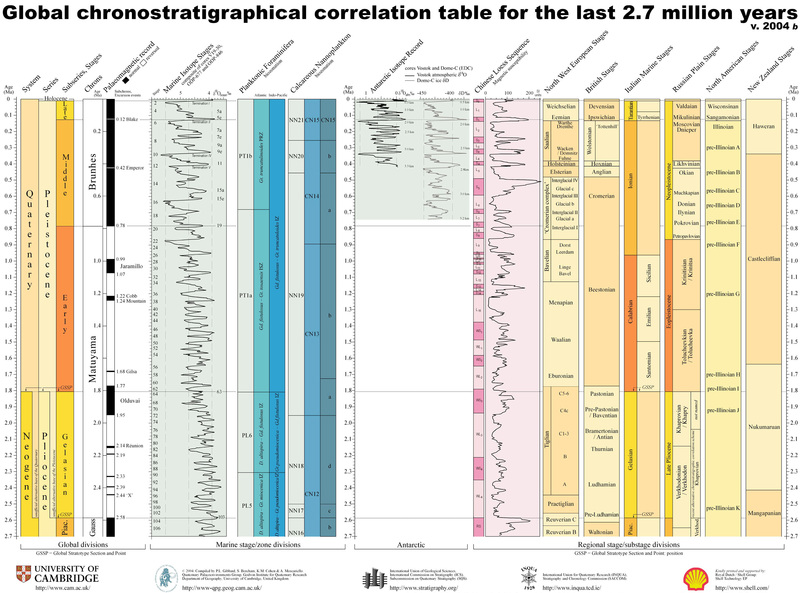 The chart was first produced and web-published on this site. 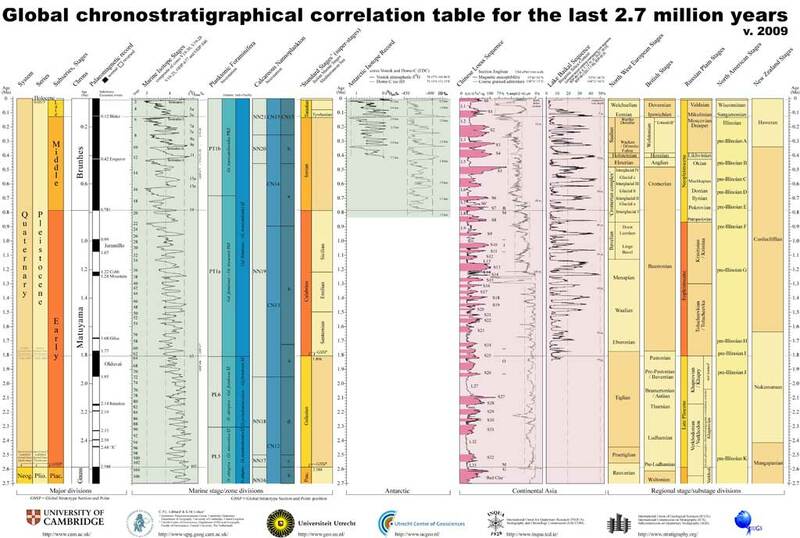 It intended to provide a simple pictorial guide to correlation of the chronostratigraphical subdivisions of geological time during the late Cenozoic, to fulfill Task C of the SQS Science Plan. The chart was compiled by P.L. Gibbard, S. Boreham, K.M. Cohen & A. Moscariello. The printing and distribution of a poster version was supported by Royal Dutch Shell BV. These privately published hard copies ( v. 2004 ) of the chart contained a serious error: the depicted Vostok curve is not the data of Petit et al. 1999, but in fact a benthic foram deep sea marine curve. Version v. 2004b has this corrected.